Our friendly team is ready to chat – either with our online tutors, call-backs or email. Let’s TEFL is powered by a team of experienced teachers from around the world. Everyone in our team has between 3-15 years of overseas ESL experience. From teaching in public schools and developing lesson materials for large chain schools, to recruiting teachers for positions all over the world – we’ve been living and breathing the TEFL life for many years. We use our personal experience to provide an unrivaled level of training and support, both during your studies, and after you finish our course. We’ve gone through the TEFL training ourselves, the excitement of packing our bags for the great unknown, the visa hoops, and the first-day nerves. When it comes to TEFL training and job placements, you’ll struggle to find a better team to support you. Whether you need more information about our course, or have some questions about the TEFL lifestyle – don’t worry. We’ve been there before and know what it’s like. If we’re not already online, we usually reply to emails within a few hours. Is this TEFL course accredited? Yes! Our Ultimate 120-Hour TEFL Course is internationally recognized and has been accredited by The World TEFL Accrediting Commission. This means that our TEFL course, grading processes, team experience and qualifications meet the stringent requirements needed to provide our students with everything they need. By earning our WTEFLAC-accredited TEFL certificate, you’ll be able to let employers know that you’ve taken the time and care to complete a truly reputable course and are ready to step into the classroom. How long does it take to complete your TEFL course? Most people complete the course within 3-6 weeks, depending on how much time they have available to study each week. Just chat to our helpful tutors! 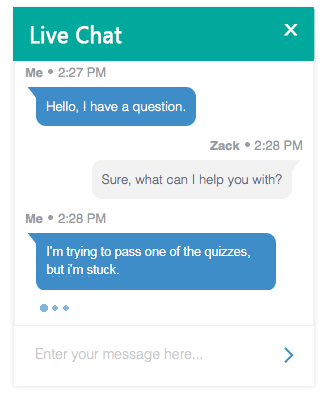 We have live chat support available for a large portion of each day. If you have any questions we can help to explain, and for any issues which can’t be solved over live chat, one of our experienced tutors will follow up with you – usually within a few hours. After enrolling you’ll have 90 days to complete your Ultimate 120-Hour TEFL Course. This is to ensure that our course graduates complete the course with all of the training fresh in their mind, and are ready to start teaching immediately afterward. If you do need extra time to complete the course for any reasons, then simply let us know and we’ll help to pause your course, or arrange an extension. After submitting my final assessment, how long does it take to receive my results? Your final course assessment will be marked by one of our experienced ESL tutors and returned to you within 3-5 working days. If you have an urgent request due to a visa application or interview, please contact us to see what can be done. Can I get a discount for referring my friend? Teaching overseas can be an incredible experience when traveling with a friend or partner. To make it easier, we offer a refer-a-friend discount. After you enroll simply email contact@letstefl.com with your names and email addresses, and we’ll send $25 USD (GBP/EUR/CAD/AUD/NZD/ZAR also available) to you, and each friend who enrolls with you. Where can I find reviews for this course? Can I still teach if i’m not a native speaker? While it’s true that some countries only permit native English speakers to gain work visas, there’s plenty of countries which welcome qualified teachers from all nations. Both native and non-native speakers have their own benefits and challenges when it comes to teaching. Native speakers have the advantage of being immersed in the language and all its intricacies throughout their life. However, it can be difficult for them to see the English language from an outside perspective. Similarly, non-native speakers might struggle with some of the finer points and colloquial phrases – however, they have the key advantage of understanding their students more deeply. Do I need any experience to teach? While having teaching experience can help to secure higher salaries, there’s a constant demand for new teachers and employers know that with TEFL training, new teachers can settle in fast. I get nervous talking in front of people – can I still teach? Talking in front of people can be a challenge which puts some people off from becoming teachers. But it’s surprising how easily this difficulty fades away when you’re actually overseas and starting to teach. What really helps is having a good lesson plan to guide you through your lesson – 5 minutes at a time, and plenty of fun games and activities that will have your class doing all the talking. How old do I need to be to teach English? For most teaching jobs and visa applications you’ll need to be at least 18 years of age. Do I need to speak local languages to teach overseas? You don’t need to speak Chinese, Thai, Vietnamese or any other language to start teaching English overseas. In fact, in most classrooms it is actively discouraged to use any language other than English. This is to help immerse students in a full English-speaking environment to help them to learn better. However, that doesn’t mean you won’t learn the local language while living and teaching overseas. Can I take my children/family with me? In many cases – yes! We often help families to start a life of teaching overseas. So long as you meet the visa requirements, it’s possible to teach in places like China, and to take your children with you. They’ll be able to enroll in local schools, pick up the local language and develop a unique set of skills. Do you help with job placements? Yes! We have an excellent service to help you find great jobs overseas. We have a strong network of partner schools in China, Taiwan, Thailand and Spain. After completing our course we can help you to get well-paid placements in these schools, and we’ll support you through the visa application process. We also provide a free short course to help you perfect your resume, learn how to give great demo classes, and prepare for tough interview questions. Note: all teachers need to meet local visa requirements to teach overseas. Can you help me find an online teaching job? We’re an authorized partner with DaDa ABC which is one of the largest and most reputable online teaching organizations. So long as you meet their requirements we can help you to get a position teaching with them and guide you through the startup process. Do your job placements come with visa support? We only provide legal job placements and guide you through getting your visa/work permit. Can you help with my resume and interview? We have years of experience with the ESL recruitment industry. We know exactly what schools are looking for, and how you can make the best impression when speaking with them. We share all of this insight in our ESL Job Training Guide.